What Do We Think About Trump? It may have been goofed about in a 2003 Onion article, but MC Serch has officially updated his list of gas face recipients to include Donald Trump. 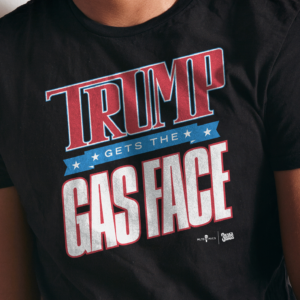 In fact, you can show your support in giving President Trump the gas face with your very own Trump Gets The Gas Face t-shirt, by Melted Microphones.